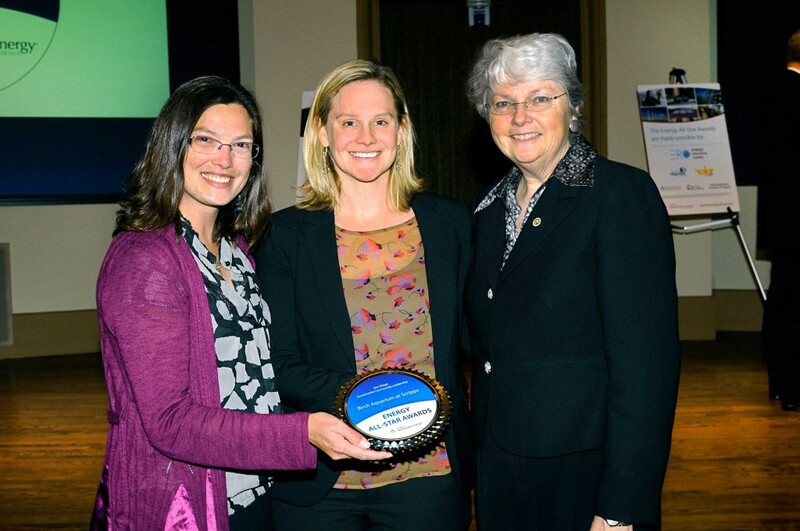 Senator Christine Kehoe (right) congratulates Catie Fyfe and Charina Layman of Birch Aquarium at Scripps. Birch Aquarium’s efforts to be sustainable and to teach the community about sustainable living garnered special recognition yesterday. 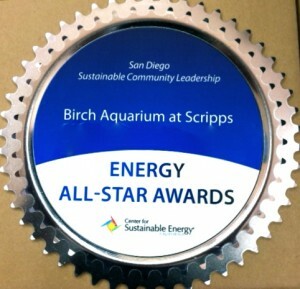 The California Center for Sustainable Energy honored the aquarium with its Sustainable Community Leadership award during the Center’s eighth annual Energy All-Star Award Ceremony. The award acknowledged the aquarium for its outstanding achievements in environmental issues and education. At the ceremony, a total of eight awards were presented to organizations and individuals in Southern California in categories ranging from commercial and residential building projects to sustainable transportation. 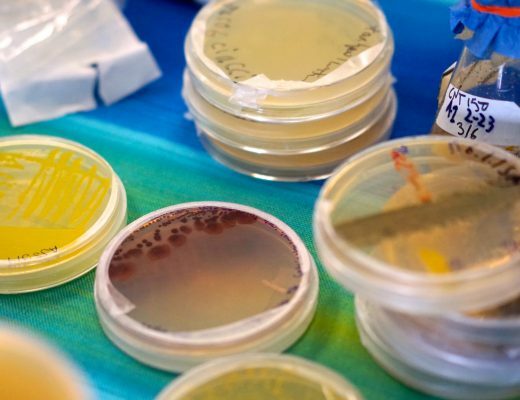 Birch Aquarium was recognized for its role in promoting sustainable practices with the creation of relevant scientific exhibits and educational programming. This included the Boundless Energy exhibit, Birch Aquarium’s outdoor exhibit that explores the ways renewable energy can power our lives. The aquarium was also lauded for its sustainability-themed SEA Days and Energy Challenge school programs. Congrats to the aquarium’s hardworking staff and volunteers! The California Center for Sustainable Energy is an independent, nonprofit organization that provides a wide range of services that help people adopt greener practices and save energy and money through rebates, technical assistance, and public education.